Your very own power-packed capsules for incredible weight-loss results. 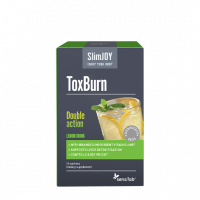 The 5-in-1 formula successfully burns fat, prevents fat-storage, skyrockets your energy levels, boosts your metabolism and curbs your appetite. Looking for the fastest way to lose weight? You’ve just found it! Fat Out! T5 Superstrength is one of the most effective scientifically-backed T5 fat burners on the market. Its incredible 5-in-1 formula is the result of years of extensive research that produced your next go-to weapon against excess weight. You’ve got that right. And thanks to an extremely powerful mix of active ingredients, its effects are 5 times stronger than those of regular T5 burners! Not only does Fat Out! T5 Superstrength significantly accelerate fat loss, but it also skyrockets your energy levels, boosts your metabolism, suppresses your appetite and regulates your hormone levels to clear the way for the fastest and most amazing weight-loss transformation possible. Say goodbye to excess weight and hello to the new you! It tricks your body into burning fat whether you’re physically active or not. Zero effort, maximum results. Stimulate your digestive system and keep it busy so that it burns calories as you go and effectively contributes to your spectacular weight loss transformation. It gives you that extra boost you need to stay motivated through the entire day at work and at home – or make your gym sessions extremely effective if you do want to work those muscles. Reduce both physical and mental stress and prevent your weight loss progress from stagnating. You have to keep the ball rolling. It’s time to take control of your body and start feeling like yourself again. Fat Out! T5 Superstrength is a super effective fat burner that gives you themuch-needed energy boost to deal with everything that comes your way and lose weight in the process. But how exactly does it work? The 5-in-1 formula stimulates your circulation, boosts your metabolism and increases your body temperature, providing you with energy and enabling you to burn as much fat as possible – be it at the gym or from the comfort of your own couch. But thanks to a powerful combination of carefully selected ingredients, it doesn’t stop there. The substances work in synergy to help your body cope with stress and maintain hormonal balance, making you feel at the top of your game. And people love it! See for yourself. The unique 5-in-1 formula was developed by our team of scientists, who hand-picked the purest natural ingredients from some of the most trusted sources and combined them in one spectacular supplement that enables amazing weight loss results in a matter of weeks! The combination of patented caffeine and green tea extracts boosts your metabolism, provides you with energy and prevents your body from storing fat. As a patented form of iron, LipoferTM ensures better absorption and overall performance. The more oxygen gets to the cells, the more fat you burn and the closer you get to your dream body. Brown seaweed is rich in iodine which is crucial for normal thyroid and hormone function. Combined with L-tyrosine, an amino-acid essential for thyroid hormone production and regulation, it restores your hormonal balance andensures much faster weight loss results. But there’s more. To control your appetite, maintain a well-functioning metabolism and support the nervous system function, we’ve enriched the formula with a powerful combination of B3 and chromium. The mix of both ensures a greater mood stability and reduces the occurrence of stress-related hunger attacks. The presence of L-taurine, the amino-acid that maintains electrolyte balance and proper hydration and ensures the digestion of fats and fat soluble vitamins (A, D, E and K), on the other hand, provides an effective protection from free radicals and stress. The recommended daily intake is 1 capsule twice per day with a glass of water after a meal. If you're having trouble sleeping, do not take this product after 3 PM. Warning: If you are sensitive or allergic to any of the ingredients in this product, or if you are taking any medication, consult your doctor before use. The product is not recommended for pregnant or breastfeeding women. Great product. I’m bursting with energy and losing weight without even trying. I’m visibly losing fat and gaining muscle. 10/10 would buy again. Burning fat like crazy. Oh, and the package is just gorg. 100% recommend! Grab your own Fat Out! T5 Superstrength and get the second one FOR FREE.